The King's Ginger Liqueur is a popular Liqueurs available from TheDrinkShop in 50cl to buy online. 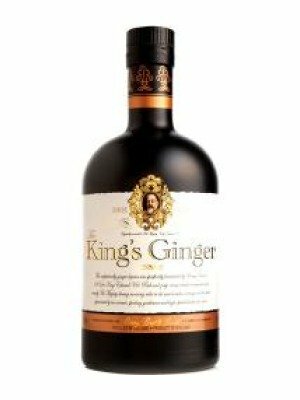 Visit TheDrinkShop for the best price for 50cl of The King's Ginger Liqueur or compare prices on our other Liqueurs products. King's Ginger was specifically formulated by Berry Brothers in 1903 for King Edward VII. This high strength liqueur has been created by the careful maceration of ginger root for 1 month, enlivened by the judicious addition of citrus in the form of lemon oil, and finished off with a touch of Glenrothes '88. Rich and zesty, the liqueur was created to stimulate and revivify His Majesty during morning rides in his new horseless carriage - a Daimler. It has been appreciated by bon viveurs, sporting gentlemen and high-spirited ladies ever since. Try it long and refreshing with ginger ale, mint, lemon and cucumber perfect for a sunny afternoon. Or just add a large dash to your champagne for a delightfully alternative Ginger Royale. Where to buy The King's Ginger Liqueur ? The King's Ginger Liqueur Supermarkets & Stockists. You can buy The King's Ginger Liqueur online in most retailers and find it in the Liqueurs aisle in supermarkets but we found the best deals online for The King's Ginger Liqueur in TheDrinkShop, DrinkSupermarket.com, Waitrose Cellar, and others. Compare the current price of The King's Ginger Liqueur in 50cl size in the table of offers below. Simply click on the button to order The King's Ginger Liqueur online now.